CSUN Central American Studies professor Beatriz Cortez. California State University, Northridge Central American Studies professor Beatriz Cortez dedicated countless hours, energy and sweat to welding a steel porch that will be showcased over the next several months at the Orange County Museum of Art’s (OCMA) “California-Pacific Triennial: Building as Ever.” The exhibition, begins tomorrow and runs through Sept. 3 at the museum at 50 San Clemente Drive, Newport Beach California. 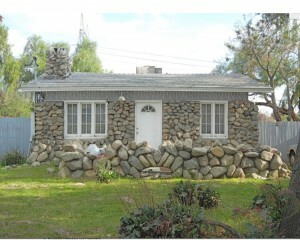 A home built from river-rock by Dan Montelongo in Stonehurst Historic Preservation Overlay Zone in Sun Valley, California. 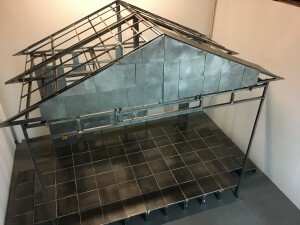 Cortez’s inspiration to weld her piece —”The Lakota Porch” — began with her interest in the home builder Dan Montelongo, a Native-American man who built “river-rock houses” the northeastern San Fernando Valley between 1923-25. Many of Montelongo’s houses are preserved in the Stonehurst Historic Preservation Overlay Zone, located in Sun Valley. The style has inspired other architects to design similar homes throughout Los Angeles and Orange County. The craftsman style that she viewed was Vernacular architecture — a style of architecture that is based on the construction of buildings and homes using only locally available materials. According to Cortez, Montelongo built his stone houses for wealthy people but as years passed, affluent residents moved away and the property values decreased. A Lakota woman currently lives in one of the homes. Cortez said she would have been unable to live in the house when the neighborhood was wealthy about 80 years ago. 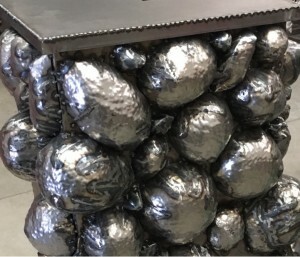 Cortez chose steel to create her piece because she wanted to imagine how someone like Montelongo would build houses if typical materials were depleted by unsustainable industrial practices. Her piece was also inspired the early 20th century back-to-the-land movement that embraced the use of traditional materials and for the economic and social reform of industrial practices. Cortez said she hopes her piece will inspire renewed interest in and help people create conversations about indigenous construction, labor, resistance to industrialization, and cultural diversity. She said viewers also can relate to the art because they have seen similar home styles around the area, and she hopes they develop a new appreciation for the various materials used to build houses. For more information on the OCMA exhibit, visit the OCMA website.